Pampanga travel agents, Pampanga hotels and resorts reservation services provided by Philippines travel agents, Philippine tour operators. 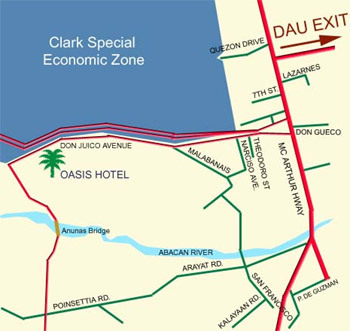 Oasis hotel is located on the perimeter of the Clark Special Economic Zone and Clark International Airport in Angeles City. It is 90 kilometers north of the Ninoy Aquino International Airport, the country's premiere airport, and 160 kilometers south of Baguio City, the summer capital. It is the heart of Angeles City's tourism and business district. Recreational facilities and entertainment areas are just minutes away.